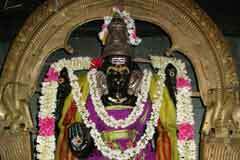 The temple is praised by Saint Tirugnanasambandar in his Thevaram hymns. 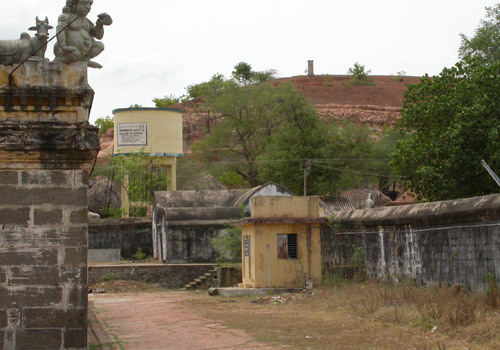 This is the 17th temple in the Nadunaadu region praised in Thevaram hymns. Purattasi Navarathri in September-October and Masi Maha Shivrathri in February-March are the festivals celebrated in the temple. Lord is a swayambumurthy in the temple. 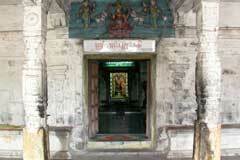 According to history of the place, the temple was raised by Sun God performing pujas to Lord. The temple is open from 6.00 to 11.00 a.m. and from 4.30 p.m. to 8.30 p.m.
Swetha and Kedila Rivers Sri Vamanapureeswarar temple, Tirumanikuzhi, Cuddalore – 607 401. Devotees perform abishek to Mother and Lord and offer vastras. The devotee can have the darshan of the Lord throughout the puja time in all temples. Here the darshan is available for a few seconds only as the curtain is downed. 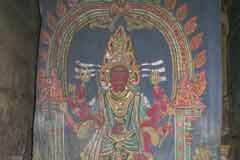 As Lord and Mother are in privacy, Bheema Rudra, one among the 11 Rudras functions in the form of the screen. Hence, the first puja is performed to him. Then the screen is raised for a few minutes for the darshan of devotees. The Mooshiga Vahan-mouse vahan- of Vinayaka is by his side instead of being before Him. The buffalo head under the feet of Mother Durga is absent. She has a club in Her hands. Four pillars in the mandap before the Lord’s shrine represent the Four Vedas. 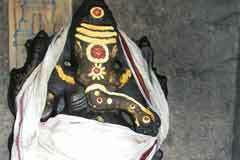 Nandhi the bull vehicle of Lord Shiva is in the right direction. As in <?xml:namespace prefix = st1 ns = "urn:schemas-microsoft-com:office:smarttags" />Madurai, Kancheepuram, Kasi, Tiruvarur and Nagapattinam, Ambica has the ruling dominance in the temple. 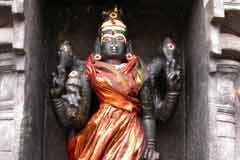 She is holding two flowers in Her hands, lotus and Neelotpala. The woes of devotees would become softer as flowers, it is said. Saint Arunagiriar had sung the praise of Lord Muruga of the temple. Salvation lamp is lit on the hill opposite the mount on the Rohini star day in Karthikai month-November-December. Thousands of devotees undertake Girivalam (going round the hill) on poornima-full moon days. 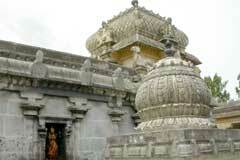 All the Gods in the temple are under Aditya Vimana. Though Lord proved <?xml:namespace prefix = st1 ns = "urn:schemas-microsoft-com:office:smarttags" />Bali’s glory, he had to incur the blame of the society for the method He employed in the event. He prayed in this temple for relief. 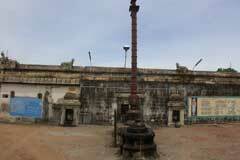 Hence, the place is named Thiru (a respectful prefix) Maani (Brahammachari Vishnu) Kuzhi place – Tirumanikuzhi. 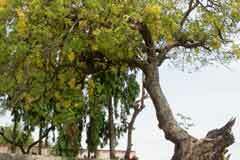 Tirumanikuzhi is 15 km far from Cuddalore. 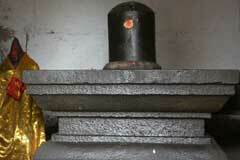 The temple can be reached by buses bound to Panruti via Palur. Buses are available from Panruti and Cuddlore.